Image credit: Wallpaper Maiden. All rights reserved. 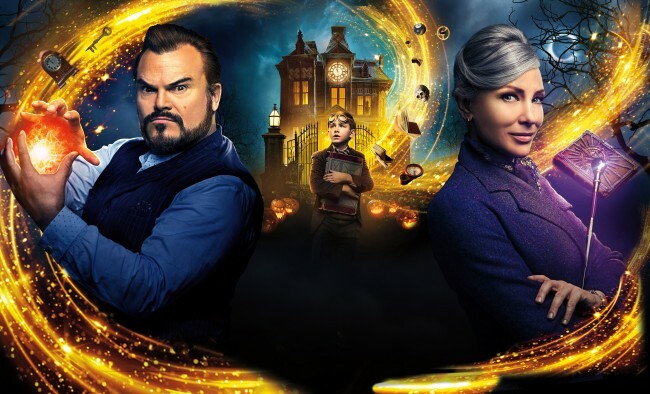 We received advanced screening tickets for a showing of A House with a Clock in Its Walls that we attended earlier tonight with our boys, ages 4 and 6. They love mystery movies and have previously enjoyed Harry Potter, Zethura, and A Series of Unfortunate Events…..which was the vibe that we got from the trailer for this movie. We received complimentary advanced movie screening tickets. I was not required to share any review but I thought it would be helpful for other parents……We arrived at the theater an hour early, got our seats together, and enjoyed some popcorn as the theater filled with people. There were lots of kids in the audience around our kids’ ages and we were all excited to watch their first “scary” movie. Since the movie was rated PG and didn’t seem too over the top, I honestly thought it would be a fun adventure for the boys and I was hoping to score some cool mom points. The first half of the movie was filled with mystery and magic. The boys were having a great time. Aidan jumped when the lady behind him sneezed and we all laughed. However, right around that time, the movie went in a totally different direction and Drew and I made the call to walk out of the movie with our boys who we felt were much too young to be exposed to the subject matter. I’ve only ever walked out of one movie in my entire life, so it was a decision I felt really strongly about. I mean, you don’t get cool mom points for traumatizing your kids, and I certainly didn’t want that to happen! My kids are WAY more important to me than enjoying a movie and I’ve usually always made good judgement calls on what I felt to be age appropriate. We watch TV and movies in our home, but we do have rules for what they are allowed to watch based on their age, what we feel comfortable with, and how they react to certain things. All kids are different. Both my husband and I agreed that some of the content in the movie was not accurately depicted in the trailer. I mean, they won’t give away the entire story….and we certainly didn’t expect them to. But we did expect to be made aware of certain subjects so that as parents, we could decide if it would work for our family. Had I known the direction the movie would go in, I wouldn’t have taken them at all. So I’m over here having a total mom guilt moment feeling like I made a mistake…..and that’s never fun. After we walked out, we took them to look at some toys and walked around the mall for a bit. They fell asleep on the way home and are fast asleep in their beds now, so they are probably fine. I’m glad we left early. I just wish we didn’t go at all and that’s based on the age of my kids and the content in this move that, in my opinion, goes beyond what one would expect from a PG rating. Now…. if you’ve gotten this far and you’re curious about what I’m referring to, the next paragraph will go into a bit more detail of the specific parts of the movie that caused concern for us with our kids. If you don’t want to have the movie spoiled, then you should stop reading here. I will do my best to not give away the entire story, but I do think as a mom, I would have wanted to know about this BEFORE taking my kids and I’ve learned that from now on, I will screen movies by myself first before I take my kids. I can’t speak to the ending or the general story of the movie since we didn’t finish watching. I don’t know how it ended. As I said, I won’t give away the entire story, but here are a few things that I didn’t like. -The boy’s parents were killed in a car crash. This was not shown, but unlike other movies that have a sad story line in the beginning, it was referenced frequently throughout the movie and was a big part of the story. -There is a lot of magic involved….. This part was totally fine for us. We like Harry Potter. However, it went to a really dark place…..this dark place involved things like….. murdering a neighbor, a dead guy being brought back to life, and the source of magic coming from a demon…..who posed as the boy’s dead mother, which I thought was kind of traumatizing for kids. There were a lot of creepy elements in those scenes like heads shaking violently as the demon came in/out of their bodies. Most of these things happened really quickly in that scene and we had to call it and take our boys out. No thank you. Not for a PG movie. Not for my kids. I know parents out there make all kinds of decisions. Some take children to adult horror films. I’m not one of those parents. I strongly believe in keeping the childhood innocence alive during childhood and keeping things age appropriate. It’s one thing to introduce kids to mystery and magic, and quite another to go to such a dark place. You have other PG movies like The Incredibles, Christopher Robin, and Peter Rabbit, and The Secret Life of Pets (which did have a pretty intense snake scene). Action scenes or a “bad guy” storyline aren’t really the issue. The action is not the problem. For me, in The House with a Clock in Its Walls, it was completely the content that came unexpectedly. The strong emphasis on murder, dead parents, demons, and similar things are not appropriate for a young audience, in my opinion. If you’re on the fence, consider screening the movie first without your kids so you can see what I’ve mentioned here….and whatever came after that I don’t know about…before you make the same mistake that we did. We appreciate our complimentary advanced movie screening tickets for this movie and hope to see more again in the future. We’ve had the opportunity to screen some great movies in the past like A Wrinkle in Time, and many others and have always enjoyed the movies up until this one. Drew and I have also seen quite a few screenings without the boys. I thought it would be fun to include them since the movie was rated PG and the trailer made it look kind of fun. This one didn’t turn out the way we had hoped, and that’s okay. Every movie has it’s appropriate audience and this was just not what I feel is appropriate for my kids.